A Baltimore police officer already on suspension was arrested and charged with drug crimes in Baltimore County Tuesday night, officials from both departments said Wednesday. 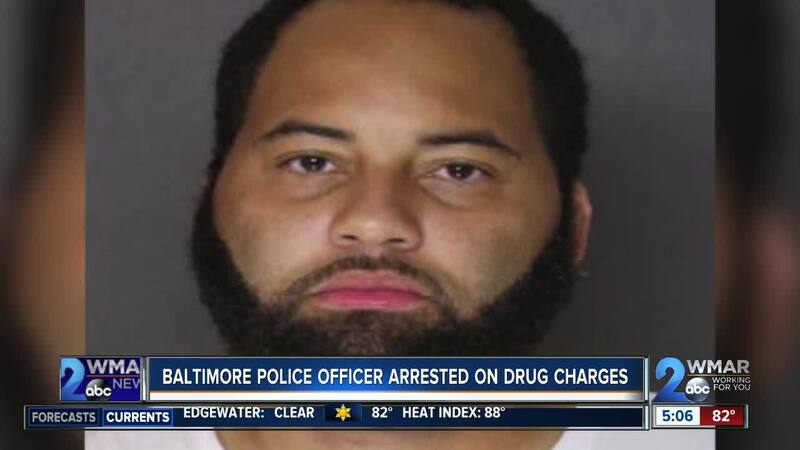 Spencer Moore, a 14-year veteran of the department, was arrested following an investigation between the Baltimore Police Department, the Baltimore County Police Department, and the Drug Enforcement Agency, acting Police Commissioner Gary Tuggle said at a press conference. Tuggle said the investigation began within the city’s internal affairs unit, who realized they would need to bring in county police, as well as the Drug Enforcement Administration. The DEA told WMAR-2 News they provided investigative and tactical assistance to county and city police departments regarding the case. Baltimore County Police said they saw a man, later identified as Moore, driving a silver Lexus in a parking lot in the 1600 block of Forest Park Avenue in Woodlawn. Officers saw Moore leave his car and walk up to a white Chevrolet pick up truck. Moore handed something to the driver of the truck, later identified as Keon Bennett, then walked back to his Lexus. Baltimore County police recognized the proceedings as a drug transaction. Moore and Bennett were detained. A search of Moore’s car revealed three pill bottles containing more than 100 Oxycodone pills, a powerful prescription narcotic. Two bottles did not have prescription labels. Police found marijuana on Bennett and more Oxycodone pills inside his truck. According to charging documents, Moore told narcotics detectives that he's addicted to Oxycodone and would sell 15mg pills he obtained through a prescription then purchase 30mg pills from street dealers. He also admitted it was not uncommon for him to take 20 to 25 pills at a time and that he had drug conversations in his phone about buying and selling pills. Moore was charged with possession with intent to distribute a narcotic, possession of a controlled dangerous substance, and obtaining a prescription by fraud. He is being held without bail at the Baltimore County Department of Corrections. Bennett was charged with two counts of possession with intent to distribute a narcotic, possession of a controlled dangerous substance, possession of over 10 grams of marijuana, and obtaining a prescription by fraud. He is being held on $50,000 bail, county police said. Moore had previously been suspended for “several months” with pay for a separate incident, Tuggle said. Police could not discuss that suspension due to restrictions governed by the Law Enforcement Officers Bill of Rights. Tuggle acknowledged Moore’s presumption of innocence and said he is now suspended without pay.